MOViN's bringing it back! 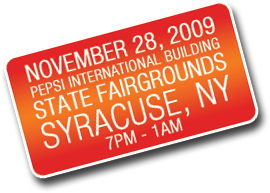 Be a part of history as Disco makes it's return to Syracuse on Saturday, Nov. 28th at the Pepsi International Building on the NY State Fairgrounds. Costumes, contests and music will fill the air featuring the best disco dance tunes of the 70’s, a light show and even a fog machine! The fun starts at 7pm for V.I.P.'s. From 7 - 8pm our VIP’s get to mill around together with free food and beverages in our special VIP suite and each VIP gets a special picture to take home to remember the evening. At 8pm the doors swing open to the thousands of lucky people that purchased a ticket (yes, tickets are limited) and the fun lasts ALL NIGHT LONG! Tickets are $15 for general admission ($35 at the door) and only $50 for V.I.P. They can purchased online at www.mydiscoinferno.com. Also, check out the site for all the information: what music groups are scheduled, where you can go for disco outfits, etc. Please keep in mind that this event is a fundraiser for the Southwest Community Center, a large local not-for-profit serving the needs of our most needy.